This DIY tutorial guide covers how to build a bird box or nesting box for your garden to attract nesting birds out of timber. We show you the sizes of the wood you need and how to put all of the pieces together to create a warm, comfortable nesting box for the birds of your garden to lay their eggs in and bring up their young. Building your own wooden bird box can be a very rewarding project especially if you have young children. Why are Bird Boxes Important for Nature? A bird box can be a great addition to your garden if you want to encourage birds and building your own means that you can tailor it specifically to attract the type of birds you want to see. If you have young children they can be a fantastic introduction to the world of nature and can provide a great starting point for teaching how birds and animals rear their young, build their homes and customise them for their specific needs, teach them to feed and fly and then let them out into the big wide world. With high winds and rain being common weather in the UK, offering birds a safe and warm place to nest and bring up their chicks ensures the survival of the UK’s bird population. 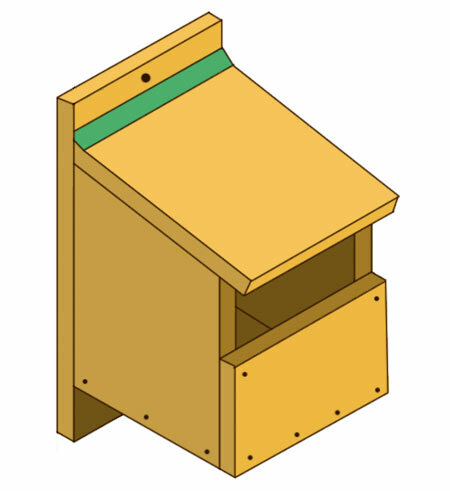 A full list of the sizes of holes required for different birds is shown below but if you would like to attract bigger birds the front section can simply be sawn in half so the top half of the front is left open. The following sections show you how to build a bird box and lists all of the wood you will need. We have also listed the tools, screws and nails you will need for this job. The timber needs to be 150mm mm wide, 15mm thick and preferably hardwood as this withstands the weather much better than softwood. 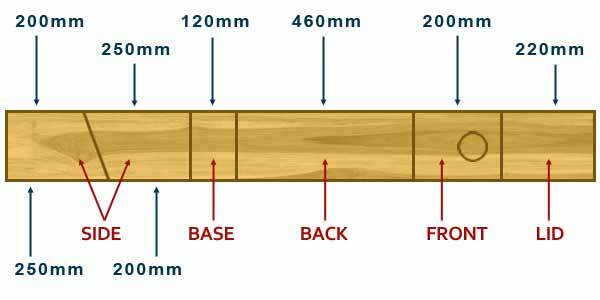 Buy a plank of wood 1500mm long. You will not use all of this but this length will allow you a mistake which most people usually make. 10 15mm galvanised felt nails. Cut out the pieces using the Jack saw, (see our cutting and sawing timber project), and sand the sawn edges to make them smooth. 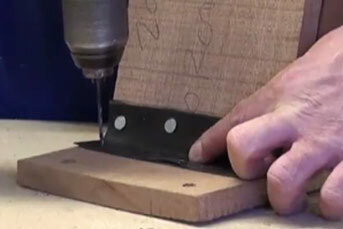 Use a flat wood drill bit to drill the hole in the front panel – the hole must be at least 125mm from the base of the box, so that small nestlings can’t fall out. Align all the pieces as shown in the diagram below and drill pilot holes for all the screws. Don’t forget to countersink the timber to accept the heads of the screws. More about pilot holes and countersinking can be seen in our project of the same name. Do not be concerned if all the parts of your bird box do not fit together as if they were made in Ikea. Carpentry is a very specialised skill and trust us, the birds won’t mind if some of the joints do not line up perfectly! Line all the sides, top, bottom and base up and use the 3mm drill bit to drill pilot holes for the screws. Countersink the top of each hole so that the screw head drops under the surface of the timber. 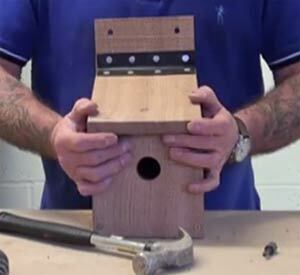 Watch the video below to see how to fit the rubber hinge to the roof of your bird box. Make sure you drill the pilot holes before you nail the rubber hinge into place. Without these pilot holes the nails may split your timber. 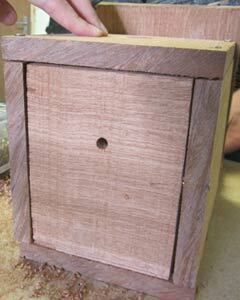 Drill an 8mm hole in the top corners of the back of the bird box. These holes will allow you to hang your bird box from a tree or fence. Also drill 2 x 8mm holes in the bottom of the bird box to allow any water to run out should it drive in through the hole at the front of through any of the joints. Do not be tempted to nail or screw your bird box directly to a tree. The tree will grow and stretch the screws which will eventually split the wood. Use the holes you have drilled in the back to tie some cord to the box and to the tree. There you have it! You have now successfully learnt how to build a bird box now you can sit back and wait for any potential new owners to move in. 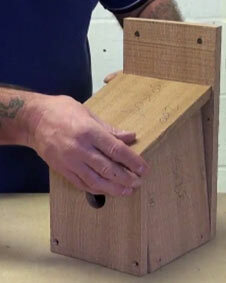 If you would like to build your own bird box we have a complete kit available in our superstore.